I have made the executive decision to wait until I get home to add photos to the blog. It takes a lot of time to select, edit and post photos and since most of our adult travelers are posting far more photos than I am, I’ll refer those who have travelers with me here in Costa Rica to the Facebook photos for now. I hope that’s ok with everyone! This blog has always been solely intended to be my personal travel journal as well as documentation of my own professional development. The fact that I have any readers at all still surprises me! I am starting to see comments from travel bloggers from around the world who have stumbled upon this blog. The internet sure has changed the travel writing industry! Today was a rainy day for us here in Central Costa Rica. We left the Arenal region after another hearty breakfast of eggs, gallo pinto, watermelon, agua fresca and toast. While we were having coffee, we spotted a toucan right outside the hotel restaurant! How amazing! After breakfast we boarded the bus for our long trek to Monteverde. While this trip is less than 50 miles, it takes about 3 and a half hours to get here because of the windy and dirt covered roads. It’s a scary trip on a large bus, but our fearless driver Ramon helped us get to Monteverde safe and sound. We made two stops along the way at what I like to refer to as Tico Truck Stops. These are very touristy places where you can grab a drink, buy a Costa Rican hat and use the restroom all at the same time. Plus, you can always grab some Pringles which the kids seem to love! We arrived in Monteverde at 12:30 for our tree planting activity. 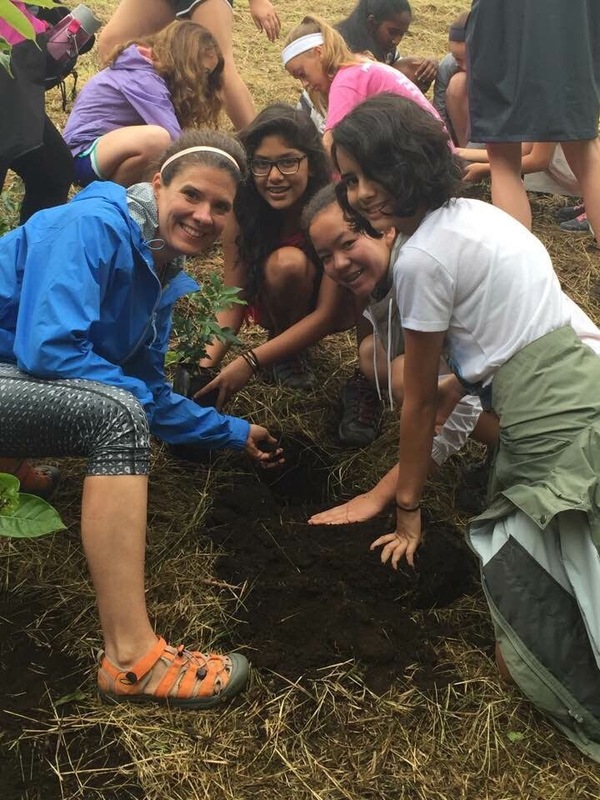 Here, each group was given a specific tree to plant. 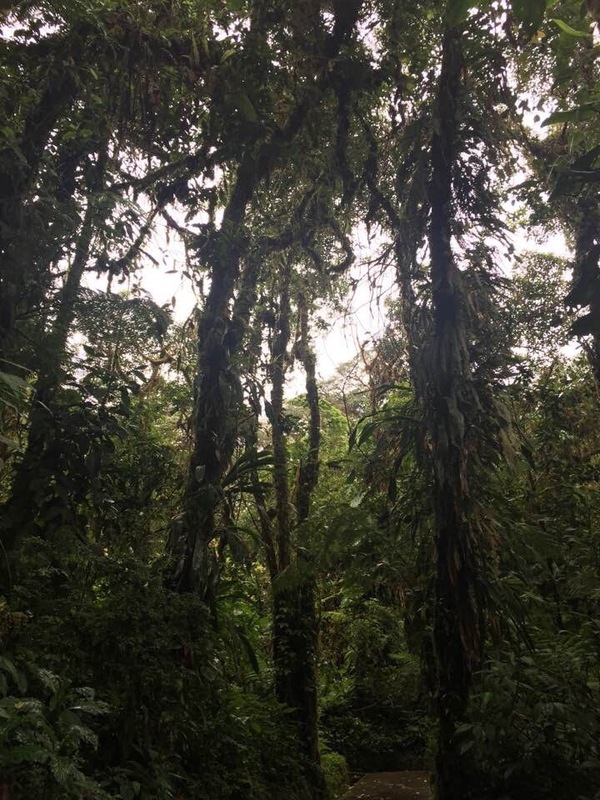 The goal is to line the corridor between the Pacific Ocean and Monteverde with a new line of trees that will attract and maintain the wildlife that has been moved away due to development. This was a short, but meaningful hands on activity that the kids will remember. Each group named its tree and said a special blessing for the tree before we left. Our tree was named Bucky after the Ohio State Buckeyes! We stopped at Sabor Tico for lunch in the town of Santa Elena. We had the choice of burritos or quesadillas. Both were served with fries which pleased the kids. I wasn’t thrilled. Mandy and I joked about how we spend so much time in the classroom trying to expose our students to authentic food items from all over the Spanish speaking world. 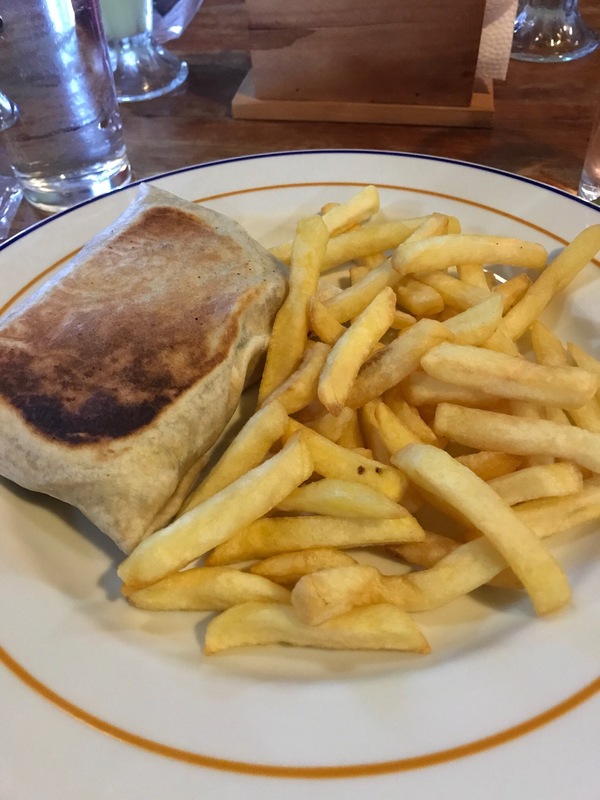 They usually come to us thinking that burritos and quesadillas are served wherever Spanish is spoken which isn’t the case! The Ticos didn’t do much today to help us tear down that stereotype! The ketchup for the French fries was actually barbecue sauce which made us laugh! The agua fresca flavor was cas which is a fruit that grows in the tropics. After lunch, we visited the Santa Elena Cloud Reserve Park. This is a beautiful, mystical nature preserve that feels more like an enchanted forest than a tropical rain forest. It rained the entire time we were there but we were still able to see many beautiful types of trees and plants in the delicate ecosystem. The hike was fairly easy and the kids seemed to enjoy it. We have so many kids who are really taking advantage of all the photo opportunities. It’s great to see them so engaged! Around 4pm, we arrived at our oxymoron of a hotel, the Santa Elena Hostel Resort. A hostel, by definition is NOT a resort and this place is no exception. I will not hide my feelings about it. We stayed here last year and it was the part I dreaded most about coming back to Costa Rica this summer. The Wifi here is completely unreliable. It is damp and buggy. This year, we have toilets that don’t work, mystery stains on beds, hairs in the dinner salad and a whole slew of other small issues that all add up to one very non-resorty experience. Add to that the smelly rooms with few (or no) outlets and constant driving rain and you start to get the idea. The silver lining is that the kids love it! They are playing foosball and chasing stray cats and dogs throughout the property. They are bonding with each other in spite of their common lack of resort amenities. Their rooms are dark and damp. They can’t post anything online. The only thing to do is hang out in the common areas and goof off together . This is precisely why I refuse to let this part of the trip get me down too much. Sometimes, we adults have to be inconvenienced so that we can sit back and watch the kids show us what it’s like to simply chill out. 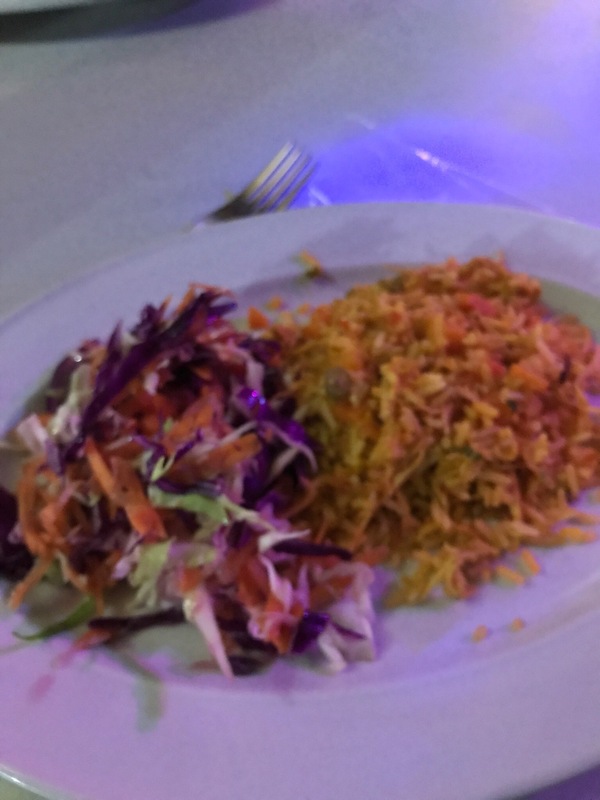 Dinner was at the hostel and included rice with chicken, cabbage salad and jello (wth?). I’m sure the kids are starting to get a little tired of cabbage, rice and chicken. I know I sure am! I read tomorrow’s menu and it’s chicken and rice again for lunch. Pasta for dinner. We are in this part of Costa Rica for two nights and then we go to the beach which is my absolute favorite part! I can make it! Curfew tonight is 9pm. As I write this, it is 8:50pm. If this year is anything like last year, I should probably get start trying to get some sleep. Bug repellant is a must for tonight. There are things flying all over my room! In addition to the bugs, the local roosters start their crowing around 3am. My fingers are crossed for us all to sleep well under the sounds of the raindrops and to wake only by the sounds of the chirping birds (and not those darned roosters). Buenas noches! LOL! So true that we become accustom and take for granted how blessed our lives really are and how pleasant the comforts of our homes are. Love this post as it shows the importance and how fun downtime can be. Thank you for contributing to our environment and have a great day! Eeewwww! I’m so not a bug in my room person. You poor thing. Es parte del encanto. Uno de los viajes más memorables de cuando vivíamos en Costa Rica, fue una visita a Golfito, en una época en la que el turismo no estaba tan desarrollado como ahora. Lo ridiculo de las instalaciones y el hecho de que todos los restaurantes estaban cerrados por ser Semana Santa hubieran desanimado a cualquiera. Aun así, nos dejó inolvidables momentos que todavía disfrutamos recordar.